Oysters. I'm not a fan. 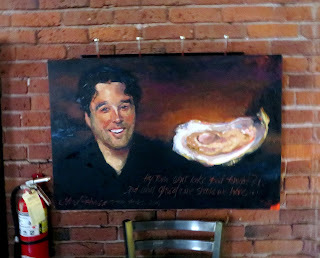 And I certainly can't understand anyone who would look at a geoduck and think, hey, I'd enjoy having that in my mouth. On the other hand, people are weird, lots of them treasure the slimey things, and people have been eating them in these parts for a few millenia. And if I'm honest, the dungeness crab that I see as one of the very most delightful things to have in your mouth is almost as counter-intuitive. Washington state produces more oysters than any other state in the country, and the largest oystering company in North America is Taylor Shellfish. J. Y. Waldrip, the great-great-grandfather of the Taylors currently running the business started pulling oysters from the area in the 1890s. It was the current generation's father, Justin Taylor, who built the business into the largest in America, and at times he had to fight to do it, filing the first environmental lawsuit in Washington state to save and restore the south Puget Sound oyster populations from pollution killing off the industry in the 50s and 60s. The Taylors are also credited with saving the Kumamoto stock after it became virtually extinct in Japan. (Washington state is now home to all edible species of oyster, but with the exception of a small number of Olympias, these are not native to the area.) Today the Taylors remain vigilent on the environmental front, as ocean acidification from rising global carbon emissions once again threaten oyster populations. 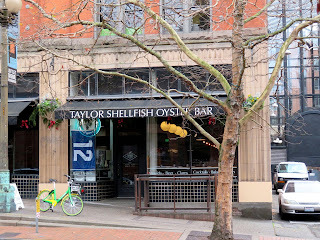 Over the last few years Taylor Shellfish has opened three retail restaurants in Seattle, two of which I count as bars (i.e. having a physical area dedicated to alcoholic drinks where minors are not allowed). The Pioneer Square version is located in the Washington Shoe Building, constructed in 1891-92 in the wake of the Great Seattle Fire having destroyed the machine shop previously on the premises. The Washington Shoe Company operated here for eight decades before moving south to Renton in 1996. To date I have identified no bars previously in the space. 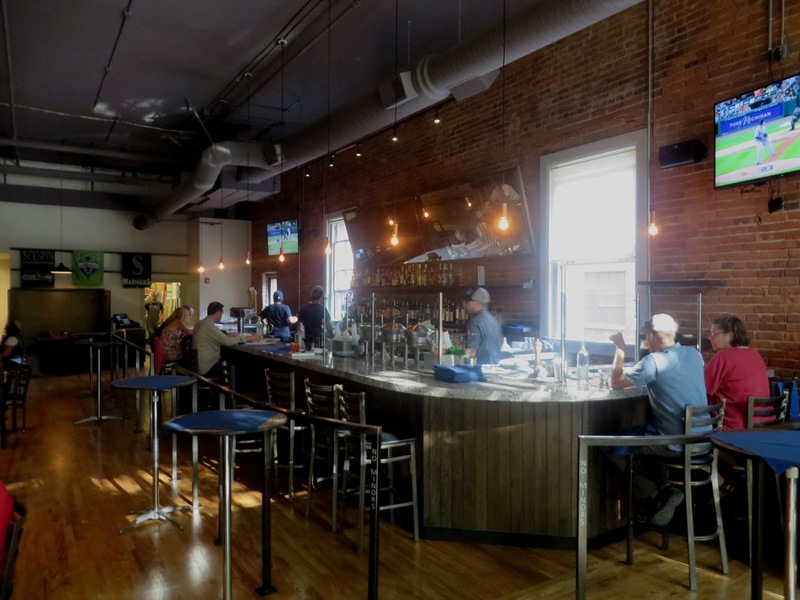 The interior of the restaurant is simple and pleasant with lots of exposed brick. The food focus is of course seafood, but they complement this with a very solid bar program featuring choices like Boulevardiers, Corpse Reviver $2s, Torontos, and Last Words. 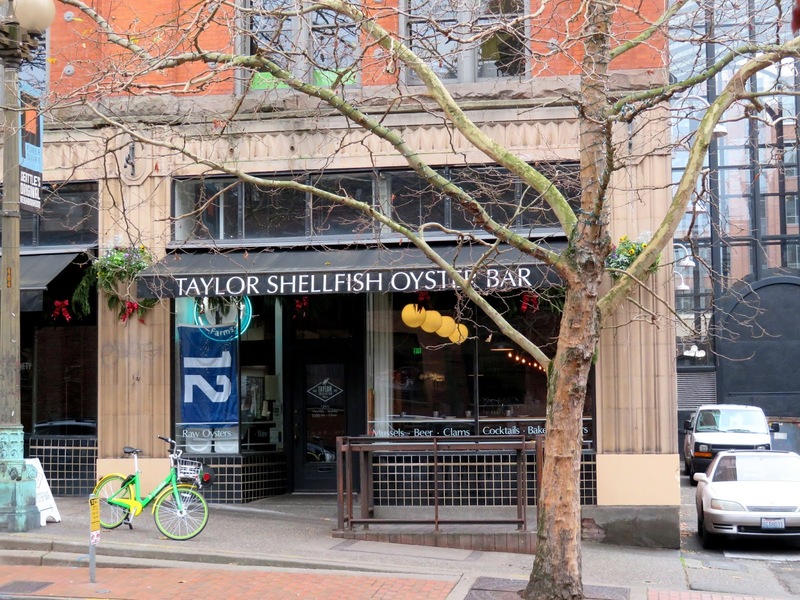 It's a pleasant stop just north of the sports stadiums -- You can have the oysters, I'll have the crab, and we'll leave the geoducks to the tourists.